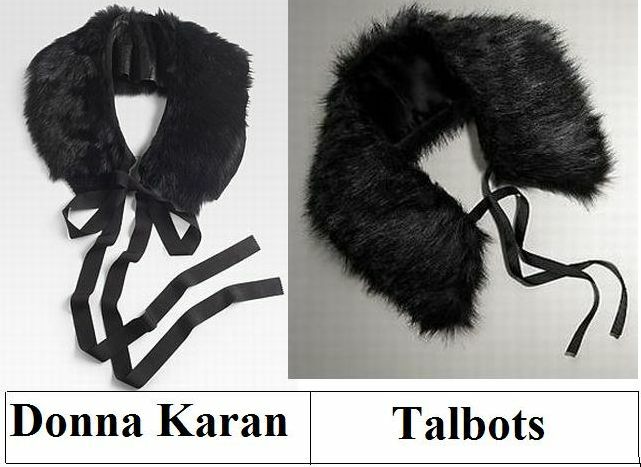 Mon chéri, in the left corner we have Donna Karan’s luscious Lamb Shearling Wrap Collar; in the right corner you will find Talbots’ fabulous Faux Fur Collar. While the fierce Talbots piece is, of course, constructed out of faux fur, as opposed to the true lambskin shearling of the Karan creation; for a mere $49.00, in comparison to the $1,295.00 price tag of its haute couture cousin, it is the frugalista’s cure for a furry craving, that is equal parts ethical, animal, and budget friendly – it also allows the budget fashionista the ability to indulge in both haute hues (black and grey)! Thanks to Saks Fifth Avenue and Talbots for the pictures. That is such a cute collar. I really like Talbots, for the price they have good tailoring. I wish I led a more fabulous life. Maybe I should just show up at the dollar movies with a fur collar. The fur is flying all over this season. From boots to vests everyone is wearing it. Donna Karan, it looks softer. Its so cool. I'd go for the gray, though. and the cheaper one. Really, it is inspiring to want to create your own like crocheting.. of course, little bouquet of flowers! I would go fake if I were to do this. But I doubt I will. Interesting. Mhmmmm...Great idea and I need it! I will have to check Talbots out! The Talbots' version is so nice. I think I may have to get that one. Happy Sunday! Its also good to check out vintage and thrift stores! I find cheap vintage collars all the time. I would have never thunk it. Very impressive. I like the fake stuff. I like the Talbots one! I like the Talbots one. Talbots will do just fine! Talbots for sure. it's considerably cheaper and the exact same collar. Be sure to enter my Lanvin, Jewelry & Makeup holiday giveaway! The collars are so cute. This is absolutely adorable -- I'll go Talbots on this one! Such a classic! Love that it can be attainable at that price. Have a cosy week ! Pretty way to keep your neck warm. To me that's key to staying warm in winter! such a must for any closet... almost exactly what i'm looking for besides the color ! What a fun piece! I actually prefer faux fur, so that's no drawback for me. Erika I am Talbots all the way lady. I wonder if they make a fur trapper hat??? Donna Karan does look softer but both look cozy and warm! okay, I love this line!!! "Which role are you playing today, kitty cats…the frugal femme fatale or the sassy spendthrift? ", so beautifully worded!!! I'm going to say Talbots all the way, faux fur is the way to go and I love, love, love the look of this and want the gray one as well! Fake please! And while we are at it I need a new LBD to go with this divine piece of glamour. Ooo, pretty. I'm definitley going for the Talbots one. I have to say, I am LOVING faux fur myself! Craving a cute faux-fur cropped jacket!